Tucked away in Rosedale/Summerhill in Toronto, this western style Chinese restaurant has many great dishes. 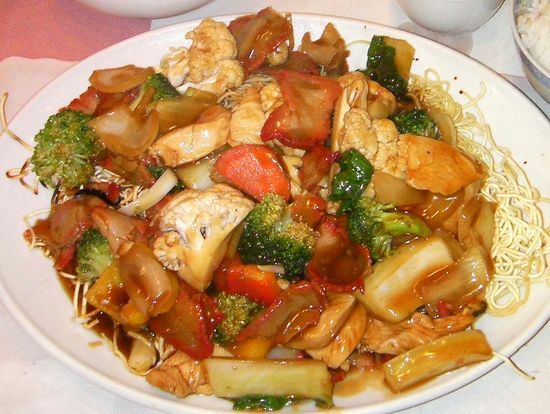 My all time favourite would be the Cantonese chow mein – hands down the portion sizes are large, the service is quick, the price is decent and it’s a family run restaurant making it very cozy. Golden House has been around for 25 years in Toronto. This restaurant services to the corporate crowd during the weekday lunch hours and feeds the residential neighbourhood for take aways and deliveries. BBQ sparerib, Crispy shrimp in salted chili pepper, general tao chicken (was there really a general?) and lastly shrimp with snowpeas. mmmmmm, it truly is a Golden House.